We loved the setting between the mountains and the sea. It was important to us to be in a small development with just a few houses, close enough to town for all the facilities but far enough away to escape all the hustle and bustle. We like being able to walk to the beach or sit quietly by our pool with the choice between the two options being the biggest decision of the day! Good sized private pool. Great to lounge around and cool off in when sunbathing, but long enough to do a few laps if you are feeling energetic. Close to local shops for basic necessities and small restaurants so no need to travel if you want to relax away from town. Close enough to Kyrenia, Nicosia and Famagusta for shopping, restaurants and nightlife if you wish to enjoy these. If you want to explore unspoiled scenery take a walk into the mountains, along the coast or take a drive and see the spectacular views from Kantara Castle and visit the beautiful Karpaz Peninsula which is easily accessible by the new road through spectacular scenery. Bathroom with bath, shower, WC and basin. Spacious open plan living room, air conditioning, sofas, satellite TV including English channels, DVD player, CD player and dining area seating six. Modern open plan kitchen with hob, oven, microwave, washing machine, fridge, dishwasher, iron and electrical appliances. The Korenium Esentepe Golf and Country Club is an 18 hole international golf course, the first to be built in Northern Cyprus located 20 minutes drive away. Notes on accommodation: Air conditioning and calor gas heater. Outside: Outside there are 2 patios plus a garden to the rear and side of the private swimming pool. Outside furniture consists of table, chairs and sun loungers. There is a large roof terrace with stunning sea and mountain views. Cleaning / Towels / Linen / Maid service: Towels and linen are included (except beach towels) and changed on a weekly basis. 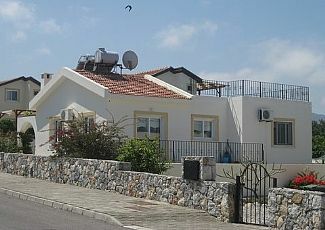 Comfortable excellent Villa conveniently situated and well presented! Lovely holiday- the Villa was excellent with Jackie and John being most welcoming, informative and helpful. Our first trip to Northern Cyprus and we’ll certainly be back - the restaurants are inexpensive and offer a wide variety to suit all tastes - the locals are friendly and helpful and all in all the best holiday we’ve ever had! Thank you Mary and Kathryn for sharing your home from home with us! Thanks for your lovely feedback we are so glad that you enjoyed your stay and hope to welcome you back again! Thanks for your feedback as we are continuously aiming to improve our guest experience. We look forward to welcoming you or your friends in the future. This villa is in a lovely location and we really enjoyed our stay. A car is a must in this location. Such a relaxing place that I read 4 books. The pool is amazing. Everyone is very friendly and helpful. Thank you so much for sharing this lovely place. Thanks for your lovely review. We are so glad you enjoyed your stay in our villa, we agree it is a great place to relax! The Villa was exactly what we wanted. Really quiet a perfect location to seriously chill out. Really well equipped and presented beautifully. Jackie and John were on hand throughout and their help was given without delay and with pleasure. Kathryn responded without delay to all of my questions. Will definitely come again. We are so glad you enjoyed your time at our villa. We hope to have you visit again soon. We booked with short notice and I'm so happy Kathryn's villa was available! It was perfect for a mini getaway to the North of the Island for myself and my partner. We really wanted a relaxing break from work and the private pool and beautiful house really felt like a home for the few days we were there - I wish we could have stayed longer! Kathryn was happy to accommodate our late afternoon check in and we were greeted by a lovely woman (I'm so sorry I can't remember her name!) who was so helpful, showing us the property and recommending local restaurants and giving us directions to the shop. The villa really felt private and the top balcony was perfect for star gazing when it got dark in the evening. We'd love to come back next year and can't thank you enough for providing a gorgeous home away from home for the weekend! Thanks so much for your lovely review. We are glad you enjoyed your stay at our villa and happy that we were able to accommodate you at short notice. We hope to welcome you back again soon. There are quiet coves 7 minutes walk away and other beaches 15 minutes drive away. Ercan airport is the closest airport. You can also fly into Larnaca airport in the South. Private transfers can be arranged from both airports. A car is necessary to get around and we can arrange car hire for you at very competitive rates. Ercan airport 35 mins. Larnaca airport 1 hour. Car essential (easily arranged). Girne/Kyrenia 35 mins. Famagusta 30 mins. Nicosia 50 mins. Esentepe 20 mins. Local shop and petrol 5 mins. If you can tear yourself away from the pool there are quiet coves 7 minutes walk away and other beaches 15 minutes drive away, local castles and historic buildings to visit and if you like walking you will enjoy the rugged coastline and the nearby hills. There are many bargains to be found in the local shops and markets. If you enjoy eating out there are several restaurants nearby and in Kyrenia there is a wide variety of restaurants and entertainment. Booking Notes: Bookings must be confirmed by telephone. A £100 deposit is required to secure your booking. The remaining balance must be paid one month prior to the date of travel. Changeover Day: Flexible changeover day. Notes on prices: Prices are for the property per week in UK pounds.